Nora Gallagher’s elegant debut novel, Changing Light, is a love story set in Los Alamos during the summer of 1945, in the shadow of the creation of the first atomic bomb. During the last summer of the war, in the beautiful New Mexico desert, a man and a woman come together: Eleanor Garrigue, a young painter from New York, and Leo Kavan, a neutron physicist. The story begins when Eleanor finds a delirious man lying by the river near her house. She takes him in and cares for him. In this novel of secrets, we learn before Eleanor does that Leo is AWOL from Los Alamos after witnessing a fatal radiation accident that has forced him to confront the moral implications of his work on the bomb. And we know, too, what Leo does not know: Eleanor is married, and has fled to New Mexico to escape her husband. As Eleanor and Leo slowly reveal themselves to each other, their pasts and the present unfold in tandem, taking us from the heady art world in New York to Einstein’s Berlin, from the bomb labs in the English countryside to the hidden city of Los Alamos. Nora Gallagher perfectly evokes the veil of secrecy and tension surrounding the Manhattan Project, the constant hum of fear alongside the remarkable fearlessness of the scientists in the laboratories. As Leo and Eleanor privately struggle with the losses the war has pitched into their lives, the two find unexpected solace in each other. Their story is all the more poignant because it can only flourish in a brief interludean interlude of brilliant madness and irrevocable change. As the scientists engage in literally “changing light,” Leo and Eleanor are connected and changed in unexpected ways by the brutal radiance of the war and their fierce love. “Light, of course, counts here. It changes for the painter and informs her vision as she sees and re-sees the landscape of both New Mexico and her own heart, ‘breaking things up into their parts or shapes, or their essences.’ The physicist actually changes the light, and he’s caught up in ‘our gift, our desire, to see a thing in the world that once was only in our minds’ until he understands that the political powers cannot resist using it. The priest finds his own quiet light of faith and honor and it carries him as he had not imagined. "This commendably ambitious novel is insistently readable, energized by lush descriptions of southwestern vistas and efficiently dramatized historical materials . . . a vivid, thoughtful book that earns the reader's attention and respect. And the story of Los Alamos cannot be told too often." In her novel Changing Light, Nora Gallagher sets out in a new literary direction. Long known as a writer of theologically reflective memoirs about life in the church (Things Seen and Unseen, 1998) the spiritual dimensions of life crises (Practicing Resurrection, 2003), and as a print and online essayist (Los Angeles Times, New York Times, Beliefnet.com, Explorefaith.org), Gallagher has now written a novel that explores the emotional, religious, and ethical dilemmas of human beings in a new mode. 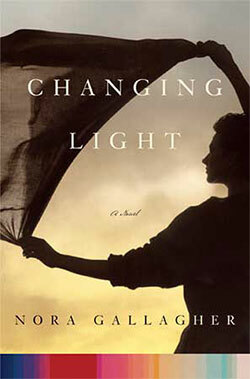 Changing Light is at once a love story, a thriller, and a reflection on the demands of conscience. It is a serious novel about serious problems. And it is a wonderful read. Gallagher’s prose is always elegant and sinuous, but it never calls attention to itself. As with Flaubert, we know ourselves to be in the presence of a shaping artistic presence, but that presence never intrudes upon the action or the characters. Changing Light accepts its characters as they are, and it provides a remarkable exposition of the social and moral world in which they operate . . . An exceptional work of fiction. "Eleanor and Leo are marvelous characters-damaged but not prone to melodramas-and through them Gallagher touches on themes of Loss, independence and intractable morality. Gallagher's first foray into fiction distinguishes itself in an intriguing and spiritual tale." "Breaking things down to truth and lightnot just paintings and atomsbut the nature of self, the sources of faith and the purpose of life. This is the subject of Gallagher's ambitious, moving and insightful novel." "An elegantly written, deeply intelligent, literary romance." "Changing Light is a beautifully crafted story, thoughtfully conceived, written and unusual emotional precision and moral clarity."